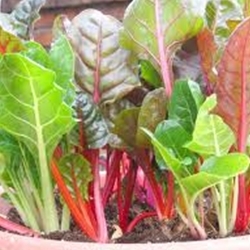 Swiss Chard is in the same family as the beet. Swiss Chard is second to spinach on the world's healthiest vegetable list. Packed with anthocyans and fiber it is rich in antioxidants as demonstrated by the vivid colors of the leaves. Available in a four pack. All plants are certified organic. Select here for transplant information, pick up and order dates. A mix of red, pink, white, yellow and orange. Color intensity is not defined early on, mostly pink, red and white at baby stage.